Want a tasty walking tour of downtown Knoxville? How about dining your way along Gay Street or Market Square and discovering a bit of history along the way? If your walking shoes are ready and you’ve got a hearty appetite then Lauren Quinn’s East TN Tours is waiting to guide you or your party to five different local restaurants, all for one price, and you’ll enjoy a three-hour gastronomic adventure. Quinn also books tours for large groups like churches and clubs, and the tours are perfect for date nights, birthdays, and anniversaries! “I can have anywhere from two to twelve people on the tour, but can accommodate more with advance notice and special requests,” Quinn told The Focus. ”We start the tours at Visit Knoxville, where guests are given discount coupons from local business for later use.” The tour is $89 each as of now, but will likely be set to a lower price starting in January 2017, and stops include places like Frussies Deli, Clancy’s, Archers Barbeque, FIVE bar and finishes up with dessert at Sugar Mama’s. “I don’t tell the restaurants what to prepare. That’s the beauty of my concept of a ’Chef’s Table Tour.’ They know we’re coming and make us something special, and there’s always lots of delicious food. So much that I encourage people to take the remaining food back home with them in to go boxes,” she said. “Make sure to come hungry and I assure you, no one ever goes away hungry,” Quinn said. A trained nurse who moved to Knoxville at the age of 16, she has a love of history and a passion for good food. “We’re less expensive than other food tours and we try to support local businesses, especially for new residents of Knoxville. About 95% of the people on the tour haven’t tried these local restaurants and it gets people out of the groove they’re into,” she said. “What’s unique about the tour is that the restaurant chefs, owners and/or managers come out to the table and visit with us,” she explained. East TN Tours invites hungry people to join the culinary walk each Tuesday and Saturday at 2 p.m. and park at Visit Knoxville or local parking garages. As we know, UT football rules most everything around here, so when there’s a home game on a Saturday, the tour will be on Friday instead. 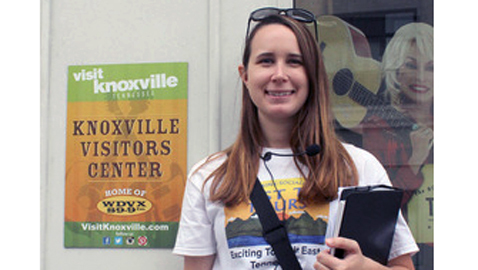 Visit Knoxville provides parking vouchers during weekday tours. Quinn said she’s also considering a smaller tour on Sundays. Quinn describes herself as a “foodie and home chef” and invites visitors, new arrivals, and native Knoxvillians to take a food walk with her. Graduating from Bearden High School and Tennessee Technical Center for nursing, Quinn formulated her business and started selling tickets and booking tours beginning August 2016, one month after she and her husband moved back here in July. East TN Tours is partnering with business and attractions like Ijams Nature Center zipline adventure course called Navitat, where guests on the tour get a discount coupon for their attraction as well. “You will also get a behind the scenes look at the restaurants and meet with wonderful chefs, owners and managers to learn the history of their businesses and the buildings and their future plans to share their food passion with the world,” she said. If you are curious and hungry you can book a date at EastTNTours.com or call Lauren at (865)410-TOUR (8687).